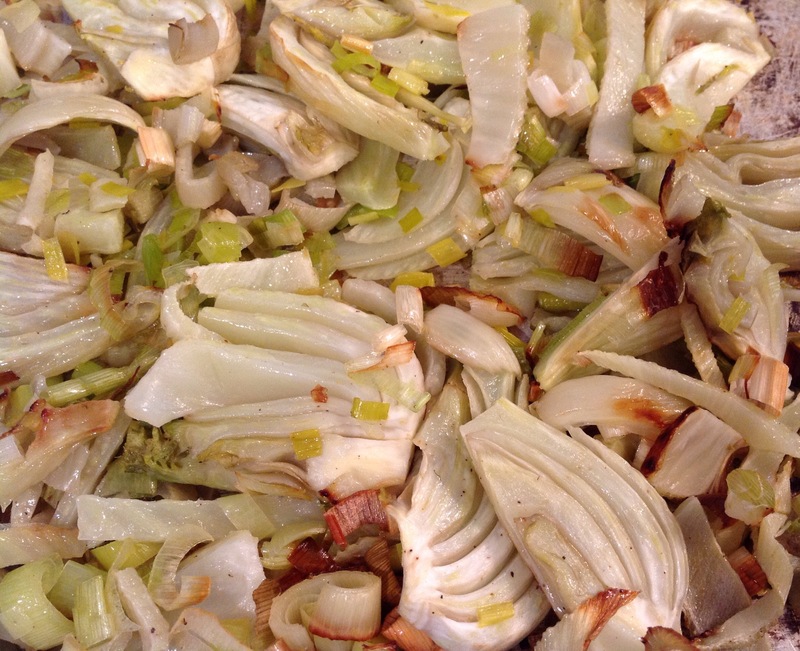 Our Italian American family always has fennel in some form on the Thanksgiving table. Often it is served raw as part of the antipasto. It is also a delicious side dish roasted. Fennel has a strong licorice flavor eaten raw, but mellows and is quite sweet when roasted. This is a simple fennel recipe that can be made a day or two in advance. The variations could include adding lemon or orange zest, Parmesan cheese, breadcrumbs, or sundried tomatoes and olives. You could also add sliced red cabbage for a more complex dish. Preheat oven to 400 degrees. Wash the fennel bulbs and trim off the top stalk. Cut the fennel bulb in half from the stalk to the core. Remove the bottom tough core. Slice lenthwise into 1/2 thick slices. Pat dry with a paper towel and place on a half sheet baking pan. Trim leeks and chop then rinse in a colander to remove dirt. Pat dry with a paper towel and add to the trimmed fennel. Drizzle with olive oil, and sprinkle with salt and pepper to taste. Toss vegetables to coat with oil. Roast for 25 minutes or until the vegetables are soft and golden around the edges. Serves 6.